The HC-05 (ZG-B23090W) uses a regular Bluetooth smd module based on the csr BC417 with a MX 29LV800CBXBI-70G flash memory chip. It appears to be using the HC/Wavesen 2010 firmware and a Google search for “HC-05 2.0-20100601″ should give you plenty to read, including some of my older posts. I have received a few comments about HC-06 and HC-05 modules that use a new breakout board (new to me at least). When I received the first comment I hadn’t seen these modules, by the time I had received the 4th or 5th comment the modules were all over Taobao so I decided to order a few (2 x HC-06 and 2 x HC05). I have no real use for these except to see if they are different to previous versions. 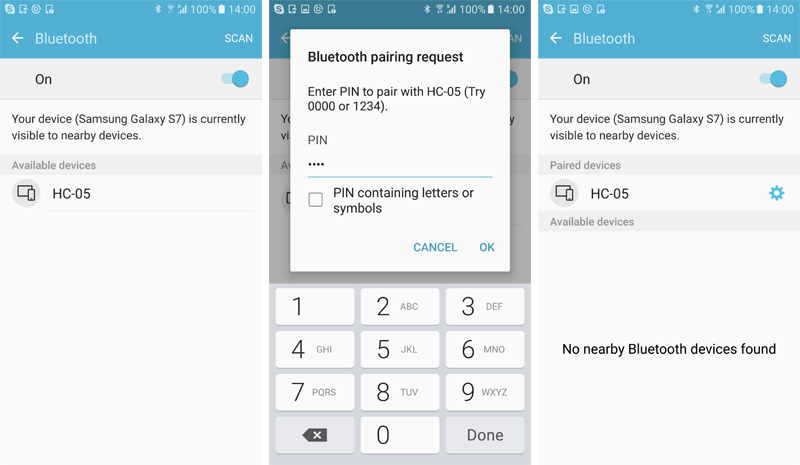 HC-05s are Bluetooth 2.0/2.1 EDR devices that have a serial UART layer on top of the Bluetooth. 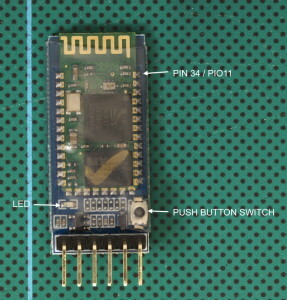 The UART layer makes them easy to use but hides the Bluetooth functions from the user. This is good if all you want is to make 2 things talk to each other. The HC-05 has two modes of operation; AT command mode and transmission mode. 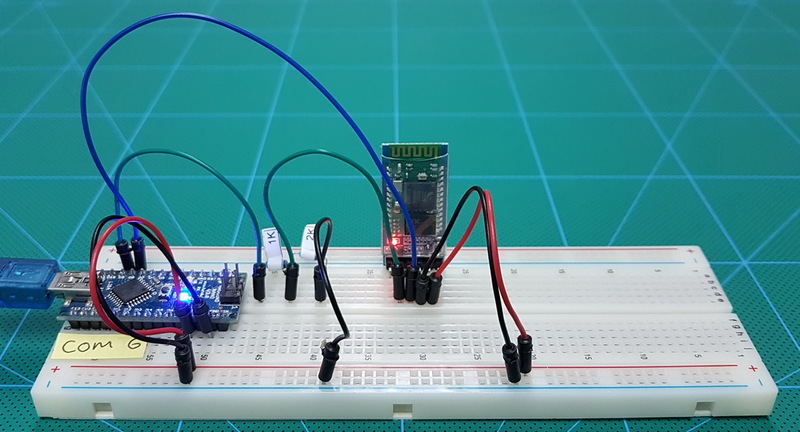 When in AT command mode all data received over the serial UART connection is treated as a command, and when in transmission mode, all data received over the serial UART connection is treated as data. When in communication mode, if there is an active connection the data is broadcast to the connected device. If not connected, the data, disappears in to some mysterious void. The HC-05 can operate as either a slave or master device. Slave devices cannot initiate connections, they can only accept them. Master devices can initiate and (depending on the actual module) sometimes accept them. If you want to use the module with a mobile device such as an Android phone, the phone will be the master device and so the HC-05 will need to be the slave. If you want to link two HC-05s, one will need to be a master and the other one a slave. The first thing with any new Bluetooth module is to power it up, see if they work and what name they transmit. 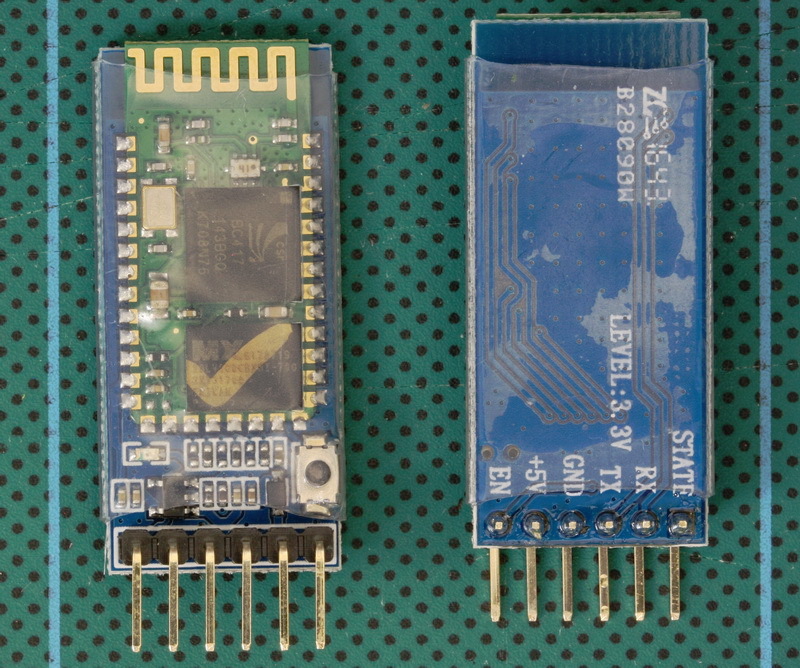 These modules seem to work fine, they transmit “HC-05″ and they pair with the PIN “1234”. This is fairly standard. When first powered, the LED flashes quickly about 10 times a second. After pairing the LED flash rate changes to a single quick flash every couple of seconds. When connected, the LED blinks quickly twice every couple of seconds. In AT command mode (the 38400 baud rate one) the LED blinks 1 second on, 1 second off (maybe a little slower). Next up is to see if we can talk to them using AT commands. 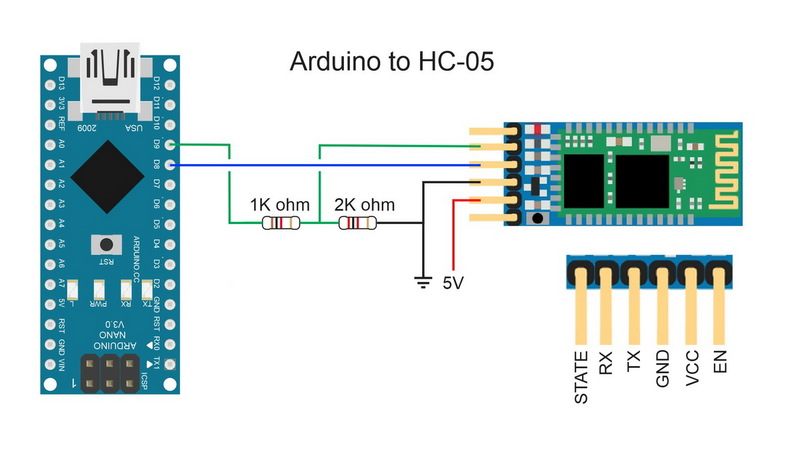 There are a couple of ways to connect serial Bluetooth modules to a PC; via a serial UART adapter, or, by using an Arduino and a serial-in serial-out sketch. 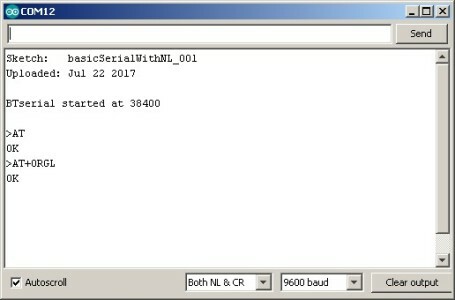 I am using an Arduino and a serial in – serial out sketch. 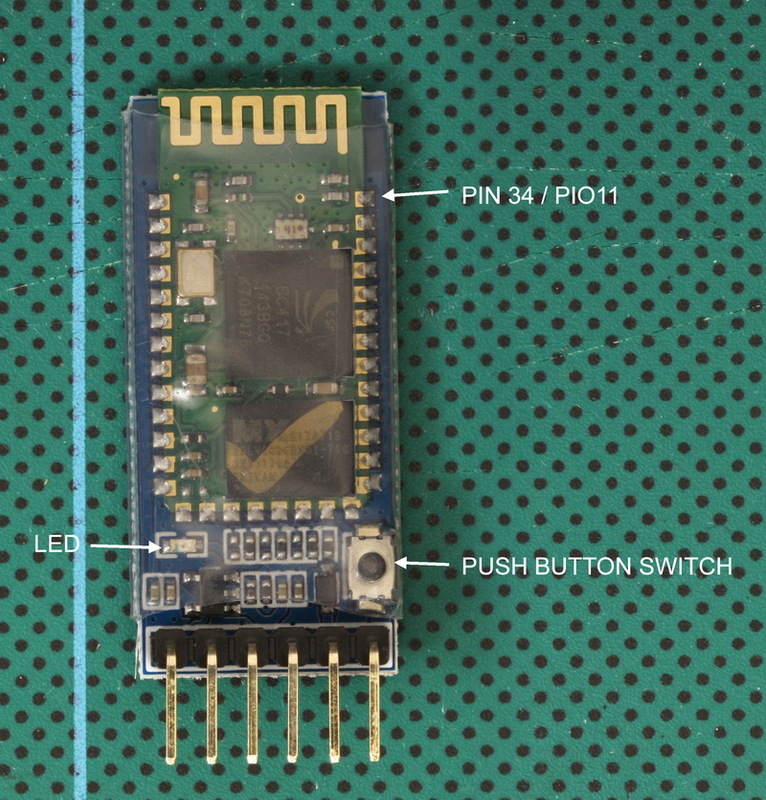 The sketch takes anything entered in to the serial monitor, echos it back to the serial monitor main window and then sends it to the Bluetooth module. 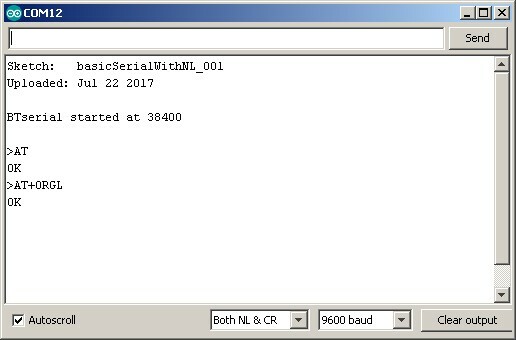 Anything received from the Bluetooth module is displayed in the serial monitor. To highlight the user entered text, a “>” character is displayed at the start of the line. Note that we are using 2 serial connections. 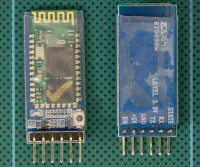 One using the serial monitor on the host computer and one to talk to the Bluetooth module. These are separate and different and have separate baud rates which do not need to be the same. This can be a little confusing to people new to the Arduino. Build the circuit and upload the sketch. When first connected the LED on the HC-05 should be blinking quickly (about 10 times a second). This indicates communication mode. To use AT commands we need to put the HC-05 in to AT command mode. To put the HC-05 in to AT command mode pin 34/PIO11 has to be HIGH on power up. On the HC-05 breakout board (bottom right corner) there is a small push button switch, this, when closed, connects pin 34/PIO11 to +3.3v, therefore, to put the HC-05 in to AT command mode, we can use the button switch. For AT command mode to be fully operational pin 34/PIO11 should be kept HIGH but this is not possible when using just the push button switch. Some commands do not work when in AT command mode and pin 34 is not HIGH. Therefore, some commands need you to close the switch before sending. If you are doing a lot of work in AT command mode you could solder a wire directly to pin 34 and connect to +3.3v. To return to communication mode, set pin 34 not HIGH (LOW or floating) and cycle the power to the module. The Wavesen 2010 firmware has a bug feature that allows you to enter a kind of mini AT mode at the user settable communications baud rate. In this mode not all commands work, “AT+NAME?” being one of them. Therefore, I don’t recommend this mode and suggest you use the full 38400 AT command mode. To enter the mini AT command mode, power on the module first and then close the button switch. The LED flash does not change. Assuming we are in AT command mode let’s try some simple commands. 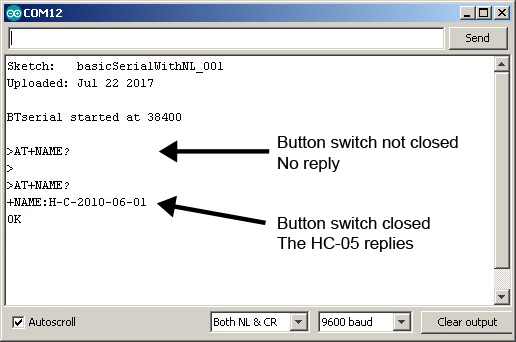 The HC-05 requires AT commands to include line endings (\r\n) so after opening the serial monitor make sure “Both NL & CR” is selected. I am using uppercase commands to keep things clear. To see what name the modules currently have, use “AT+NAME?”. Note that “AT+NAME?” requires pin 34/PIO11 to be HIGH so, just before sending the command, close the button switch. If you send the command and pin 34/PIO11 is not HIGH the HC-05 will not reply. “H-C-2010-06-01″ is the firmware default name which comes back after a factory reset. The name the modules were set with when I bought them was “HC-05″. “AT+ORGL” reset to factory defaults. This entry was posted in Arduino, Bluetooth and tagged Bluetooth, HC-05 by Martyn. Bookmark the permalink. Hi, i did everything right, but at AT Commands i type “AT” and the module dont return me “OK”, i set the boud rate 38400 and nothing! What can i do? If you are sure you have the same module than double check all connections. Then check again. Check the voltage divider and make sure you have the correct resistors and that they are in the correct position. If you are not sure you have the same module you need to find out which one you have. There are many different ones and there are many different firmwares. I’m trying to change the PSWD to my module, but I can’t, the name I changed, I think becouse i’m using the Bluetooth HC-05 version 3.0. Could any body tell me how can I do that please? thank’s. how can i erase the flash..on chip..